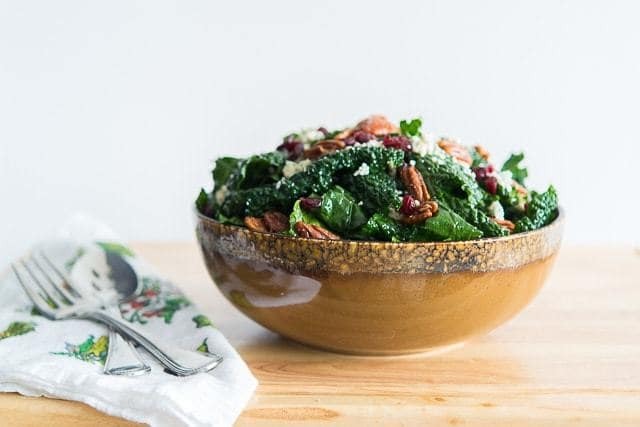 Massaged kale is tossed with candied pecans, blue cheese, and cranberries, for this simple and delicious Kale Salad. This is how Jim Gaffigan, one of my favorite comedians, opens up his segment on Kale. With all the talk about kale as a superfood, I understand where he’s coming from, but all of that aside I think kale is TOTALLY delicious! Seriously. I eat it because I love how it tastes. (But if you feel the same way as Jim Gaffigan does about salad, start with this how to eat salad every day guide from my friend Mary). Like many vegetables, kale needs to be prepared right. This salad here is how I eat my kale about 75% of the time. Raw in a salad with candied pecans, cranberries, and blue cheese. I devour the stuff. Beyond the additional goodie ingredients, it’s important to sprinkle some sea salt into the salad before massaging. One of the secrets to a really good salad is adding a pinch of salt to bring out all the flavors. It makes a world of difference. I photographed some of the “step by step” but they were really just photos of the ingredients. It’s super simple to make this, and the recipe below is little more than amounts of ingredients, which can be tweaked to your liking. Enjoy! 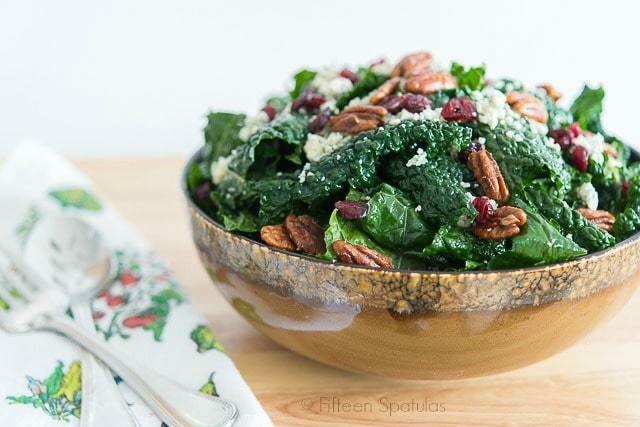 Massaged kale is tossed with candied pecans, blue cheese, and cranberries, for this simple and delicious salad. Stripe the dino kale leaves from the stem by pinching at the base of the stem and pulling it through. Once all leaves are removed, discard the stems and rinse the leaves well. Dry in a salad spinner or with paper towels. Place the kale in a large bowl. Whisk together the olive oil and vinegar. Drizzle over the kale leaves, then add a pinch of salt and pepper to the greens, and massage the leaves with your fingers. Add the pecans, blue cheese, and cranberries, and toss. The salad is ready to serve. Enjoy! Simple and delicious. This has become one of my favorite salads! Thank you! 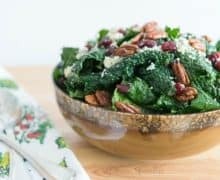 I was looking for this very combination of ingredients with the kale and blue cheese and cranberries. It went beautifully with a fall lunch I hosted. I added some minced garlic and shallots that I heated on the stovetop to the oil and lemon juice for the dressing. That sounds great, Marisa. So glad this turned out well!